Obility + Offerpop’s paid search efforts initially focused on promoting whitepapers, look books, and guides. The content performed very well, generating a high volume of conversions at an efficient cost. The issue with this tactic was that the prospects downloading the content did not fall within the ICP for Offerpop. Obility needed to change our approach to pivot our target to larger, enterprise companies. This needed to be done while increasing the overall volume of marketing-generated leads. Once the recommended changes were implemented, Offerpop began to see significant improvement almost immediately. Within the first month, MGL volume increased 96%. Volume increased steadily month-over-month, with the CPMGL improving by wide margins every month. 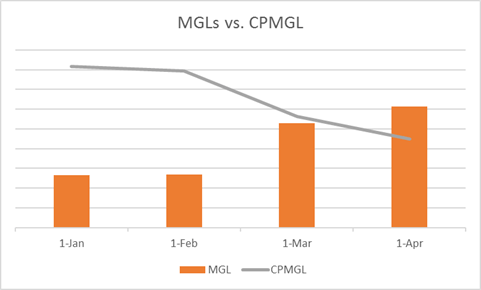 From February to the end of April, the cost per MGL dropped over 43%. In addition to efficiently increasing overall volume, the quality of leads fell in line with Offerpop’s ICP. Prior to February, 24% of the leads being generated aligned with Offerpop’s ICP. From February to April this percentage increased 29%, with over 30% of MGLs falling into the ideal customer profile. Now rebranded and known as Wyng, their Visual UGC Marketing SaaS platform empowers brands to encourage and leverage user-generated content at every stage of the buyer journey, improving marketing performance. Leading brands and agencies use Offerpop’s Visual UGC platform to create campaigns and promotions from a library of templates to inspire the creation of quality UGC, manage and leverage UGC across marketing channels, and build consumer profiles to improve segmentation and targeting. The platform enables you to encourage more of that visual user-generated content, identify the best content, and leverage it to maximize the return on your existing digital marketing channels. The company is headquartered in New York City, with offices in London. You can learn more about them here. We have one purpose: help B2B companies generate demand and increase revenue through online marketing. Located in Portland, Oregon and founded in early 2011, we’re a fast-growing agency with a global client base ranging from early stage start-ups to multinational enterprises. Our focus is on B2B companies and we’re proud that our growth has been due primarily to client referrals. We are always looking for the opportunity to work with new clients and would love to work with you.